BANGUI, Central African Republic: The line of parents waiting to see doctors stretches back outside the hospital into the dusty courtyard. Mums and dads carrying weak, starving children. Many hanging limply in their arms like half empty sacks of rice. The scene at the pediatric complex in Bangui, capital of Central African Republic, is not dissimilar to a war zone. And as conflict tears through the country, people here are desperately fighting another deadly foe: hunger. In a doorway, a young girl stands with the round shape of her belly protruding out above her skinny legs. A few meters away another malnourished girl sits barefoot, joints protruding, with shoulder blades poking out of her skin like blades, a baggy top the only clothing to cling to her perished frame. “Central African Republic is one of the most difficult countries to be a child,” Donaig Le Dru, UNICEF spokesperson in CAR, said. The statistics underline the horrors that stalk childhood in the country. Infant mortality in CAR is the highest in the world, according to the UN. One in 24 children die in the first 28 days of life. The number of children with severe or acute malnutrition rose from around 32,000 to 43,000 between 2014 and the end of 2018. And two out of three children — 1.5 million youngsters in total-are in need of humanitarian assistance, according to UNICEF. The UN’s World Food Program warned last month that CAR was facing the worst situation of food insecurity in four years, with nearly two million people in urgent need of food aid. One of the world’s poorest countries, the CAR spiraled into bloodshed after longtime leader Francois Bozize was overthrown in 2013 by a predominantly Muslim rebel alliance called the Seleka. Nominally Christian militias called the anti-Balaka emerged in response, accelerating a cycle of sectarian violence. France intervened militarily from 2013 to 2016 to push out the Seleka, winding down the operation after Faustin-Archange Touadera was elected president. The Bangui hospital is just a few kilometers from the mainly Muslim PK5 district-an area that has become a flashpoint in the troubled country. But just five pediatricians work here, struggling with limited equipment or support eked out of the creaking healthcare system. 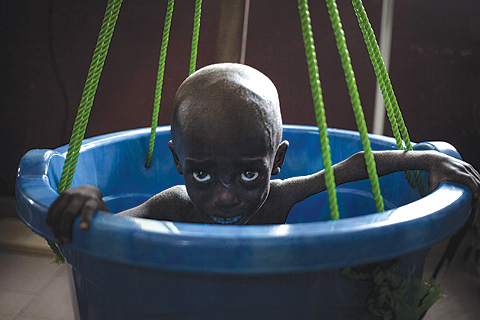 Inside the hospital, a group of parents and children stare at a malnourished girl crying during what has become a daily routine-being weighed on scales in a large blue bucket. One by one, the children are lifted onto the scales as other emaciated infants and parents look on, waiting their turn. In the overcrowded hospital grounds, a father called Theodore hugs his young daughter who is suffering from malnutrition. His wife is in hospital after having a nervous breakdown, he says, after the couple’s first child died. He struggles to earn enough money to buy food.